“We call for the government and electoral candidates to prioritize the health of the people by ensuring the increases on the nurses’ wages and set the P30,000 entry-level salary for both nurses in private and public sectors by passing the House Bill 7196 into law,” said Filipino Nurses United national president Eleanor Nolasco. 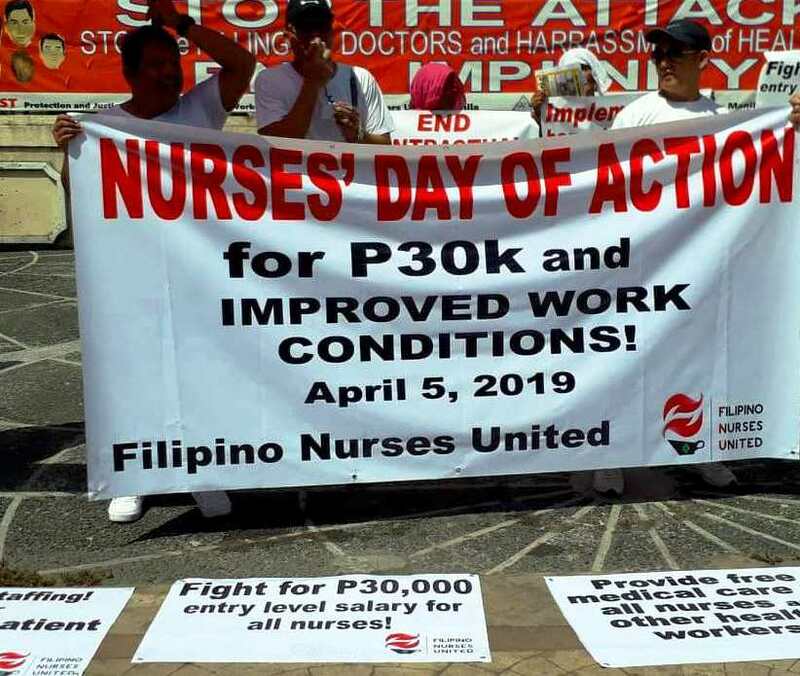 FNU and several other health groups have exposed the working conditions of many Filipino nurses, with the majority of 90,000 licensed nurses continuously being underpaid and overworked. This, the group added, is due to the failure of the implementation of just wage and benefits along with their call for the humane work conditions through their appeal on just intervention of the government. “We lament the economic abuse by the way of prolonged work hours from 12 to 16 hours of duty”, said Gov. Erlinda Palaganas, national president of Philippine Nurses Association(PNA). Palaganas also mentioned that the absence of job security and patient workload beyond the standard of 12 patients for every nurse have drained the nurses physically, emotionally and mentally. Such dire working conditions are pushing Filipino nurses to seek better-paying jobs abroad. Government records reveal that 19,000 Filipino nurses have left the country annually from 2012 to 2017. “We (the FNU) are alarmed with the on-going worsening crisis of the nursing profession in the Philippines, which highly affects their health care delivery system.”, said Nolasco. As health workers and providers, FNU along with the other groups, calls for the nurses to unite in asserting their worker’s rights alongside the struggle for people’s right to health.